Paper is jammed in the paper output slot or in the rear tray. Remove the jammed paper following the procedure below. 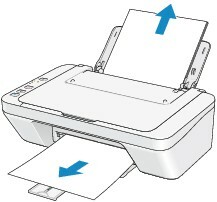 Pull the paper out slowly, either from the rear tray or from the paper output slot, whichever is easier. If the paper tears and you cannot remove the jammed paper from the paper output slot or the rear tray, remove the paper from inside the machine. Reload the paper, and press the machine's Black or Color button. If you cannot remove the paper or the paper tears inside the machine, or if the paper jam error continues after removing the paper, contact the service center.